Comfort meets style in this stunning design by revered designer Marina Rinaldi. 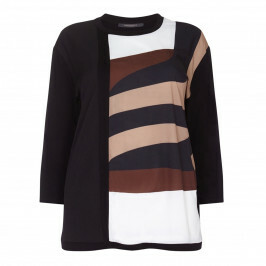 Striking with rib detailing, this tunic will elevate your look. Ideal for smart/casual wearing with a pair of slim fitting blue jeans and sneakers. Cream knit top with raised beige stripes. 100% Cotton. Hand Wash or Dry Clean.